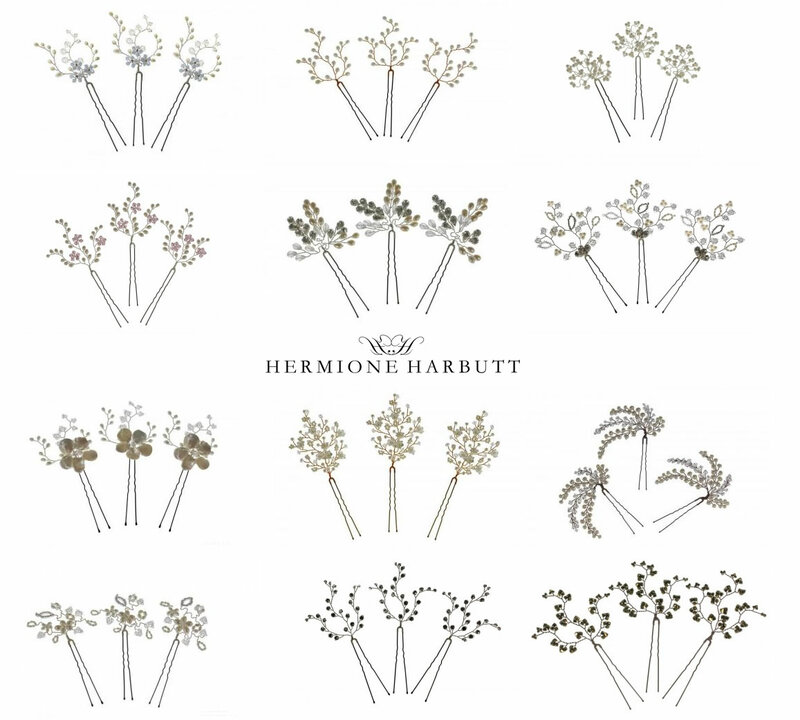 See the links below for the full range of Hermione Harbutt Hairpins. Hairpins can be grouped together to form a display. They are usually sold in sets of three, but if you are interested in bridal hairpins as gifts, perhaps to your bridesmaids we can provide them individually, and always gift wrap in beautiful packaging. a U-shaped pin for fastening the hair. A hair pin or hairpin is a long device used to hold a person’s hair in place. It may be used simply to secure long hair out of the way for convenience or as part of an elaborate hairstyle or coiffure. The earliest evidence for dressing the hair may be seen in carved venus figurines such as the Venus of Brassempouy and the Venus of Willendorf. The creation of different hairstyles, especially among women, seems to be common to all cultures and all periods and many past, and current, societies use hairpins. Hairpins made of metal, ivory, bronze, carved wood, etc. were used in ancient Assyria and Egypt for securing decorated hairstyles. Such hairpins suggest, as graves show, that many were luxury objects among the Egyptians and later the Greeks, Etruscans, and Romans. Major success came in 1901 with the invention of the spiral hairpin by New Zealand inventor Ernest Godward. This was a predecessor of the hair clip. The hairpin may be decorative and encrusted with jewels and ornaments, or it may be utiliarian, and designed to be almost invisible while holding a hairstyle in place.